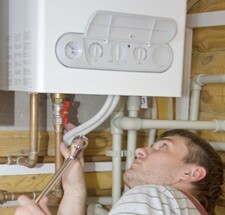 If you're after boiler repairs or servicing, be safe rather than sorry and ensure you use a Gas Safe registered plumber. We have Gas Safe registered plumbers on call 24 hours a day to deal with your boiler repairs, so you won't be without heat and hot water for long. We can also carry out boiler servicing on an annual basis to reduce the liklihood of breakdowns - don't run the risk of your boiler letting you down when the temperatures drop. We can provide the whole range of plumbing and heating services to Bristol residents, so call now on 0117 345 9036. We don't charge call out fees at all - even for emergencies - so no need to worry, even if you need boiler repairs in the middle of the night. Just pick up the phone and call us. You'll be surprised at how affordable we are - we promise!